Governor Kim Reynolds has declared this “Crime Victims Rights Week.” “This commemorative week celebrates the energy, perserverance and commitment of Iowa’s victim service providers and champions who continue to advance the cause of justice for crime victims,” Reynolds said during an event in her capitol office. 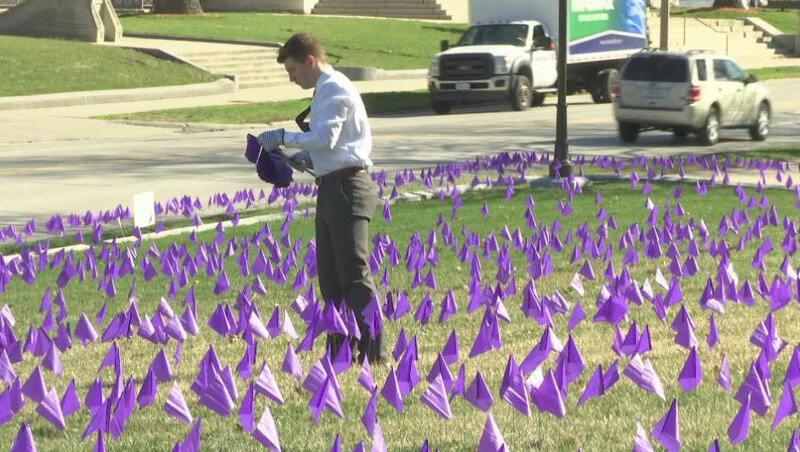 More than 7,000 purple flags surrounded the capitol building earlier today, signifying the number of Iowans who have been victims of violent crime in the past 10 months. Reynolds has been an advocate for a crime victims’ amendment to the Iowa Constitution alongside her call for an amendment that would automatically restore voting rights to paroled felons. Both proposals stalled in the Senate this year. Reynolds says the timeline hasn’t really changed, though, as the process for amending the constitution will give lawmakers another chance next year to make some decisions on felon voting rights and victim rights.